AHEAD of 25th anniversary celebrations for The Salvation Army in the Republic of Georgia (Eastern Europe Territory), the International Headquarters Communications team has produced the first of a series of films documenting the diverse ministries being carried out in the country. 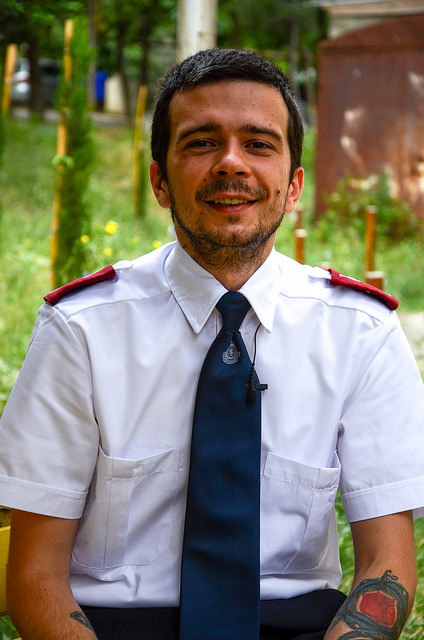 Temo’s Story is an insight into the life of Lieutenant Temo Galustian, a Salvation Army officer who ministers in the Georgian capital Tbilisi. A former gang member, tattoed with criminal symbols, Temo was previously involved in various illegal activities. In his own words, he ‘tried everything that it was possible to try on the streets of Tbilisi’. His most enjoyable days, he recounts, were those ‘when I was stealing something with my friends and then we were running from the police’. But despite feeling that he had ‘power’ and friends on the streets, Temo also felt angry and confessed that he was ‘searching for God many times’. Before being caught, he met his future wife, Nino, on the streets of Tbilisi and married her while in prison. In the film, he speaks movingly of her commitment to pray for him. ‘She was fasting, she was praying a lot,’ he says. And her prayers were answered. He started attending an Orthodox chapel towards the end of his jail sentence, and began to pray himself. Once released, he started attending The Salvation Army’s Tbilisi Central Corps, where Nino was working at an after-school programme. Temo’s Story is available to watch and download in HD quality via the IHQ Vimeo channel at http://www.vimeo.com/salvationarmyihq/temo, as well as Facebook and YouTube. The film is in English with subtitles in Georgian and Russian. Further video features documenting The Salvation Army’s diverse work in Georgia will be released in the run-up to the 25th anniversary of the commencement of Army ministry in the country in October 2018.